Having worked with both public arts institutions and artist-led independent outfits, I see that there is much that public venues can learn from their grassroots counterparts. There are inevitable differences between the two types of organisation. The size, degree of external funding and constitutions of public galleries usually mean that they have more responsibilities than grassroots organisations, especially in these austere times when everything must be justified. However, they are both still in the same business – producing and exhibiting art. There are some things that artist-led organisations could learn from public institutions, such as trying harder to attract audiences from a wider demographic beyond ‘the art world’, but by and large it seems like the learning should be in the other direction. Many public arts organisations are far too hidebound by hierarchy and bureaucracy, dominated by endless meetings and managers only interested in delegating all of the ‘practical’ work. Artist-led organisations seem to be much better at flexibility and pulling together. Without legions of assistants and contractors or large budgets to play with, whoever is responsible for, say, the installation or marketing of an exhibition, usually just gets it done with whatever is available. Such circumstances can often make people very creative and I have seen brilliant results produced with very little resources. Artist-led organisations also tend to be better at sharing responsibilities for the grim and boring work – paying the gas bill, taking out the rubbish, serving refreshments at events. Aside from saving money by not having ‘operational’ staff separate from the programme side, getting involved in such work tends to give people a much clearer perspective on the reality of things beyond the world of creative ideas. Because of this, such organisations are also often better at being on the ‘ground floor’ with their audience, seeing how projects are received, what works and what doesn’t. This lack of separation of day-to-day operations from the creative programme might not be possible in very large institutions, but it certainly is in the small to medium ones. Grassroots organisations are usually also better at allowing everyone within a team some form of input into the direction of an organisation and its creative output. This not only helps make everyone feel valued, but it can aid in generating new and interesting ideas for programming and subjecting them to the required scrutiny. Artist-led outfits also often have more rotation of those at the top, which helps keeps things fresh and organisations fluid, organic and adaptable. Public institutions meanwhile have a habit of becoming self-perpetuating and repetitious; dominated by the ideas of a few central leaders, often far too focused on what others are doing in similar institutions elsewhere. The teams within grassroots organisations are also often more successful at working with the wider ecosystem of the arts in any given location, which can help build audiences and provide effective networks for successful operation. Developing links with local designers, businesses, artists and collaborators, means they avoid relying on handing out contracts to remote and often overpriced operators, who may frequently fail to deliver. Adopting practices such as the above are especially important for smaller public arts institutions which, by their nature, must be more dynamic and efficient. In these times, such institutions have little room for people who don’t pull their weight towards the wider goals of an organisation, or who wish to only exist in some ‘creative’ space disengaged from day-to-day reality. The best small arts organisations already do this, but many more could learn. This is not to pretend that all grassroots organisations are without dysfunction, hierarchy and ego. Nor is it to imagine that institutions of any kind don’t need direction, or that leaders can’t inspire and drive an organisation to great results. Yet, being a more collectivised organisation does tend to create an interdependent reliance which is usually both more efficient and more effective in delivering goals. A model that could help create more sustainable public arts institutions which can survive and thrive in this new, more pragmatic era. This piece appeared on Arts Professional in May 2012. When the arts funding cuts were finally announced last year, there was trepidation in Liverpool as in the rest of the country: what would close? What would be cut back to the bone? There were inevitable causalities, and Liverpool lost the A Foundation, a huge complex of former industrial buildings which had opened in 2006 as an independent contemporary art space. Yet, it was not the end for the site. Three creative businesses already located in the vicinity; architects Union North, design agency Smiling Wolf and the Elevator Studios complex, got together with building owner, arts’ patron James Moores, to develop a new broader and more sustainable model for the venue. From this, Camp and Furnace was born. 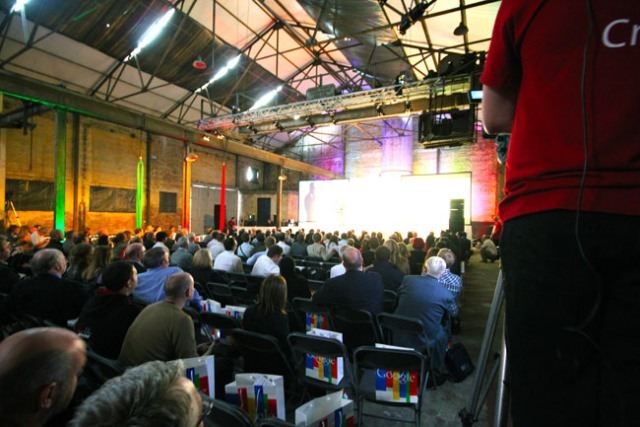 Venue Manager Ian Richards describes Camp and Furnace as a “constantly evolving, independent, cultural destination”. Since it’s reopening a few months ago, it has hosted several club nights, the Liverpool Food and Drink Awards and even Google’s first ‘engagement day’ in the UK. On 16th December, the venue will host a ‘Winter Picnic’ promising ‘fake snow, real food and open fires’. With the pretty much consistent shortage of funding for the arts in Liverpool, there’s always been a tradition of DIY culture, which has led in more recent years to a more entrepreneurial spirit in the arts. Another example is Mercy, a creative collective which came to prominence during the build up to Liverpool’s Capital of Culture year and has gone on to do commercial design work for everyone from Diesel to Arctic Monkeys. Throughout though, they have also organised their own boundary-pushing arts programme, most recently a series of events in collaboration with the Abandon Normal Devices festival. Whether we like it or not, the arts are changing from a model dominated by public-funding to something more fluid, and those organisations that are flexible and self-sustaining are the ones that will likely survive and thrive in this changed climate. This piece appeared in the November 27th 2011 edition of The Big Issue in the North.